The question of what IoT (Internet of Things) really is, and why it’s relevant in a business context should be addressed. The Internet has changed industries simply through its power to give you access to data anywhere, anytime. It’s been played out already with security systems, wearables, and countless smart devices that spread across a variety of industries, with a variety of purposes including entertainment, health monitoring, security notification systems, and beyond. BESIDES CONVENIENCE AND INSTANT GRATIFICATION, WHY IS IOT BENEFICIAL TO BUSINESS? First, we must address the concept of the “thing,” if in fact, the thing can be anything. When a thing is connected to the Internet, it then has the capability to both send and receive information, which elevates it to becoming a “smart thing.” So, the obvious next step is to consider how that benefits the thing in question. The easiest example is a phone that also serves as a music playing device. No, there may not be endless storage on the phone for every song in the world; but if it’s a smartphone, the phone IS capable of sending and receiving data. Therefore, it potentially has access to every song in the world that is available for streaming online. SMART DEVICES CREATE BETTER SOLUTIONS AND OPTIMIZED PROCESSES. This is where things get interesting for business users, because business is built on the exchange of goods and services. If the tools you use to do business, whether it’s B2B or B2C, are now capable of collecting/sending/receiving relevant data from the Internet with less effort, you’re increasing efficiency. More output (units produced, tasks accomplished) with the same input (time, energy, money, resources), or the same output with less input. Industrial applications, like manufacturing, benefit from more production at less cost, because greater revenue is thereby implied. Of course, other industries benefit from these gains as well. 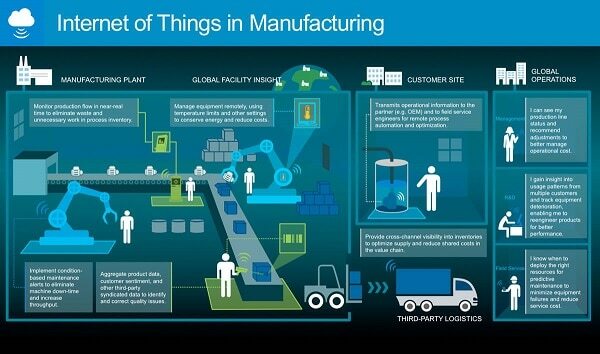 WHAT ARE SOME EXAMPLES OF HOW IOT DATA IS APPLIED IN THE MANUFACTURING BUSINESS? Manufacturing Operations Management (MOM) can benefit from IoT through assistance and improved monitoring of asset management, intelligent manufacturing through better monitoring of production workflows, performance optimization through intelligent data collection, thereby improving planning in general, and smoother operational workflow with better visibility end-to-end. Assets in the manufacturing business decrease in value over time, but with IoT, the process can be slowed down with better monitoring and maintenance. Sensors can be used to predict wear, tear, potential breakdowns, bottlenecks, and more…all depending on products you work with. Going outside of the manufacturing facility to the service provider arena, the information collected from the source can be used for better planning, scheduling, forecasting, and proactive customer service. The content greatly depends on the product or service itself. THAT IMPACT HOW IOT DATA IS USED. INFORMATION THAT WE CAN’T EASILY IDENTIFY WITHOUT THE USE OF TECHNOLOGY. Aside from just collecting and sending data to the important parties, IoT can also receive data, and create certain triggers that create action. In manufacturing, an example could be the management of an asset remotely, based on certain limits such as temperature. If the temperature sensor on a machine reaches a limit, it can trigger an automated response that sets a limit on the machine to conserve energy, keeping costs low, potentially protecting the value of the asset over time, and reducing the cost of resources. Another example would be monitoring the moisture in soil, for a farmer. When it reaches a certain point, automation triggers automate the sprinkler system to turn off. The options are endless. Let’s go back to the concept of “smart things,” where the premise is the thing’s ability to access information that it wouldn’t normally access without the power of the Internet. Now, combine the benefits being able to receive and send information to the ability to act on that information, with triggers based on the data that is received, and now you have the potential to create systems that are intelligent. Going back to the soil irrigation example, if you’re able to receive weather data, in conjunction with information about moisture in the soil from your irrigation systems, you can make predictive decisions to prevent over-watering, and automate solutions based on that information. The power of this kind of technology goes far beyond your business’s core competencies, but it’s best to start with what’s most relevant to your business today. 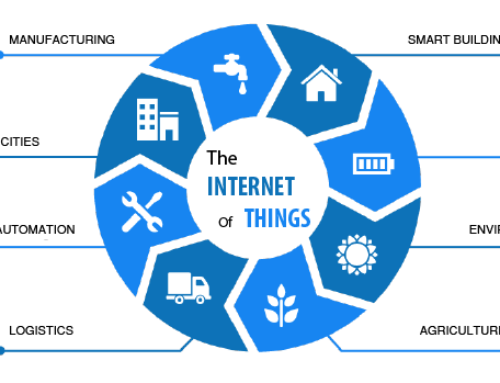 LET’S GET INTO MORE DETAIL WITH SEVEN MAIN ATTRIBUTES OF IOT THINGS. First, sensors or devices collect data from their environment. This data could be as simple as a temperature reading or as complex as a full video feed. We use “sensors/devices,” because multiple sensors can be bundled together, or sensors can be part of a device that does more than just sense things. For example, your phone is a device that has multiple sensors (camera, accelerometer, GPS, etc. ), but your phone is not just a sensor since it can perform many actions. The sensors/devices can be connected to the cloud through a variety of methods including: cellular, satellite, WIFI, Bluetooth, low-power wide-area networks (LPWAN), connecting via a gateway/router or connecting directly to the internet via ethernet. The Internet is either contained in the thing itself (ex. smartphones), or a connected hub (ex. Roku) that collects data from a variety of objects that send and receive data to and from the cloud. Once the data gets to the cloud, software performs some kind of processing on it. This could be very simple, such as checking that the temperature reading is within an acceptable range. Or it could also be very complex, such as using computer vision on video to identify objects (such as intruders on a property). Remote IoT Devices will differentiate from today’s smartphones in that they will benefit from additional features that are useful in business applications. Devices will benefit from improved efficiency, operating for a year or more unattended and conserving energy. They won’t be as easily accessible for charging. Depending on the use-case, and how broadly objects with sensors need to be distributed, IoT sensors would need to be inexpensive. Environmental factors could impact the technology, therefore certain IoT devices would need to be designed as such. Regulated and sensitive data may be accessed by certain IoT, and therefore needs to be protected as such. Every sensor/device that is connected to the internet becomes vulnerable to being hacked. Hacked sensors/devices are bad. Not just for the owner, but for everyone else too. Therefore, security needs to be a priority. Have all the data values been accumulated in the environment? Are there any gaps in a series of reported events or sensor values that should have been captured? Are the values being captured within a reasonable time frame and synchronized within that context? Every organization has great potential to benefit from more thorough end-to-end data collection. When products are passed between the hands of various departments, it’s difficult to track how things could potentially be handled better, where losses occur, when it’s taking too long to get from one point to another, and everything in between. IoT devices can provide more access to consumer data, but also track and record patterns in which consumers interact with the devices themselves, providing the intel for better device intelligence. When devices become more intelligent, businesses using them can find ways to offer better user experiences and make improvements for better growth and revenue. Once information is gathered through the device that provides intel about the product lifecycle, the consumers, and the market, IoT devices can improve business productivity in measurable, tangible ways. Whenever more can be done is less time, and potentially with less resources, more accurate and efficient processes can be put into place, which keeps your business one step ahead of your competitors who may not already be implementing such measures. When productivity and efficiency is increased, naturally, so will profits. All industries are becoming more open to being more mobile and allowing their employees to work remotely, whether that be because of business travel, supporting families, or simply providing more flexibility. 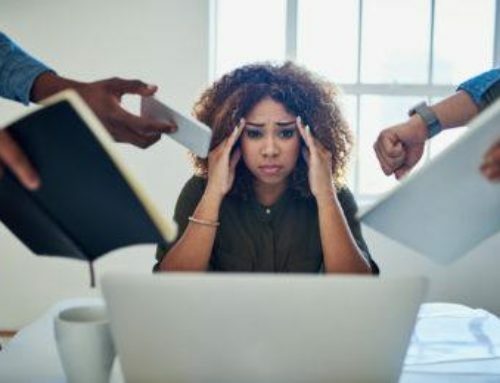 But because of this, it’s necessary to provide your team with the tools needed to ensure that they can be just as successful at home or on the go as they are in the workplace. Many studies have shown that employees who are given a certain amount of remote flexibility tend to be happier and more productive overall, which has a significant impact on company morale and can improve your business functionality over time. With IoT technology, there are certain tasks that can be managed and overseen without needing to be physically present. As technology evolves, so do careers. IoT technology will require new skillsets regarding the type of devices and software that your organization uses, which will in turn create a need to begin hiring more technically skilled workers who can interact with this technology properly. Workplaces in every industry are progressing technologically, and as expectations will continue to require more technical knowledge in other industries, manufacturing is no exception. Businesses will start recruiting individuals with this type of knowledge, and therefore individuals will begin to train differently for their careers in order to fulfill this need. Smart workplaces are evolution of industry, and even if your organization hasn’t gotten that far, rest assured that your competitors is considering these changes as well. The businesses that are resistant to change will suffer more than those who embrace it. Imagine the power your organization can gain by understanding your customers at next-level detail. Every aspect of your organization can benefit from the insights that IoT technology can bring to your CRM system by the collection of data, analyzing that data, and communicating that data about product usage and customer behavior straight to Salesforce. IoT not only offers the opportunity for new devices to be invented, but also new industries, or new branches within existing industries to be invented. IoT examples that have already changed society include ride-sharing, home automation, electric cards, medical monitoring, and even manufacturing robots. But this is just the tip of the iceberg.  COMBINE IoT DATA WITH CUSTOMER CONTEXT. in a way that keeps them spending money with your organization.  EASILY INTERACT WITH YOUR DATA USING BUSINESS LOGIC. Where applicable, employees can benefit from interacting with IoT data. Salesforce IoT is a low-code development platform that is language-based.  CONNECT YOUR IoT STRATEGY TO YOUR ENTIRE PLATFORM. 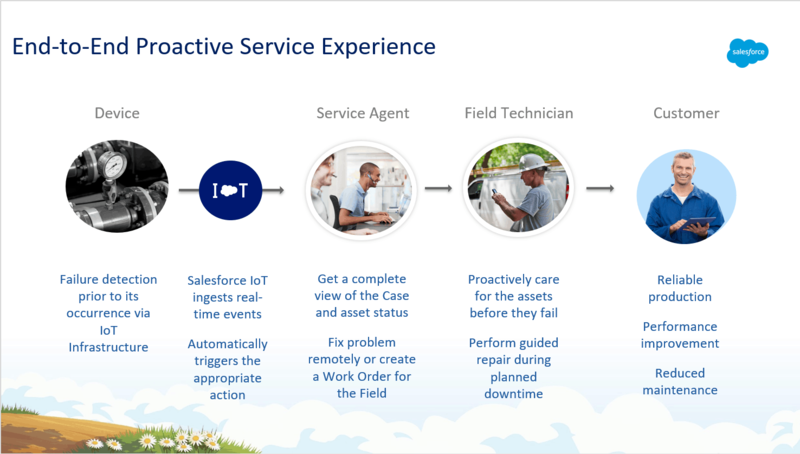 This technology allows you to better support and serve your customers through their use of connected devices, from anywhere within Salesforce.  GROW YOUR BUSINESS WITH INSIGHTS YOU CAN USE. Improve business by building better products and create more engaging and thorough business models with visibility into how your devices are actually used. 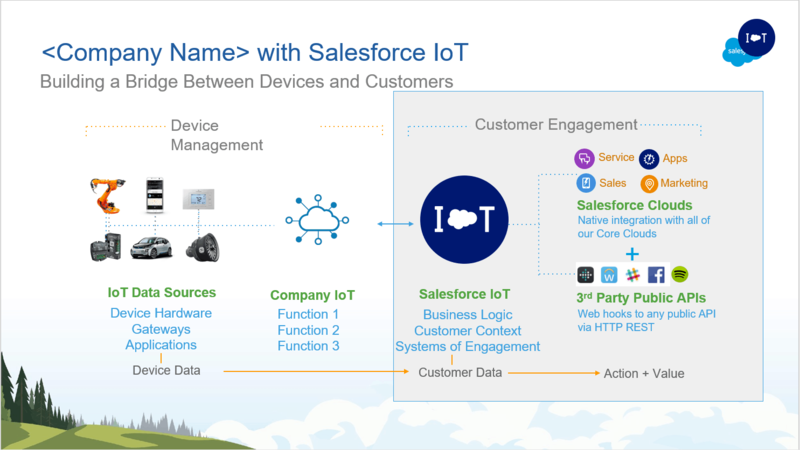  HOW DOES SALESFORCE AND IoT COME TOGETHER? entire vertical. 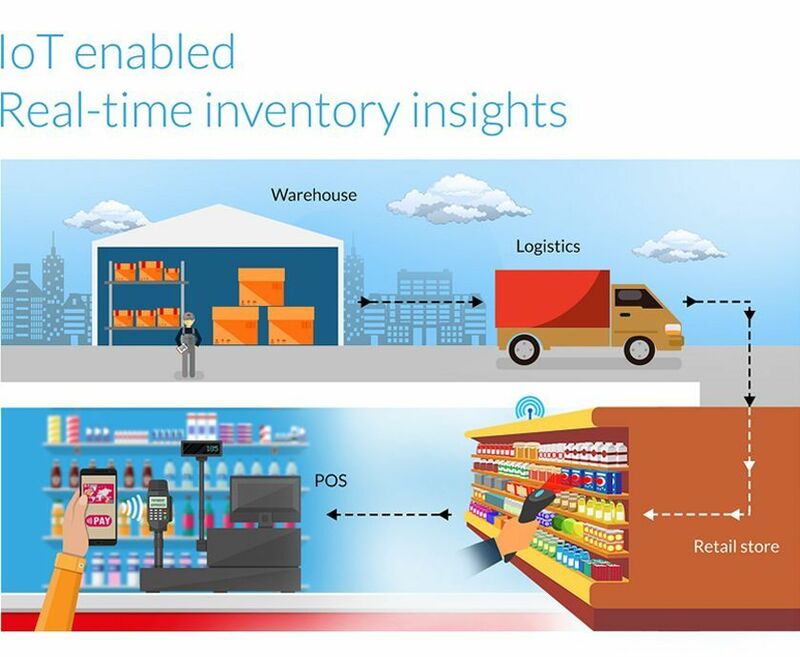 Organizations are finding new ways to connect their physical assets to their customer experiences. things connect to each other over networks and other systems, to the cloud. It refers to how things connect to each other over networks and other systems. requires to ensure that everything is operating at full capacity.  CUSTOMER EXPERIENCE is impacted by using the data that is created from all the connected things in IoT. Proper use of this data can transform every aspect of your business, including how you service, market, and build apps. In conjunction with Salesforce, as the number one CRM, your team can harness data streaming from their network of connected products and reimagine the way they sell, service, market, build apps, and more. When it comes to customer experience, Salesforce has already made a massive impact, creating one of the most powerful, flexible, and integrative experiences currently available in the CRM market. 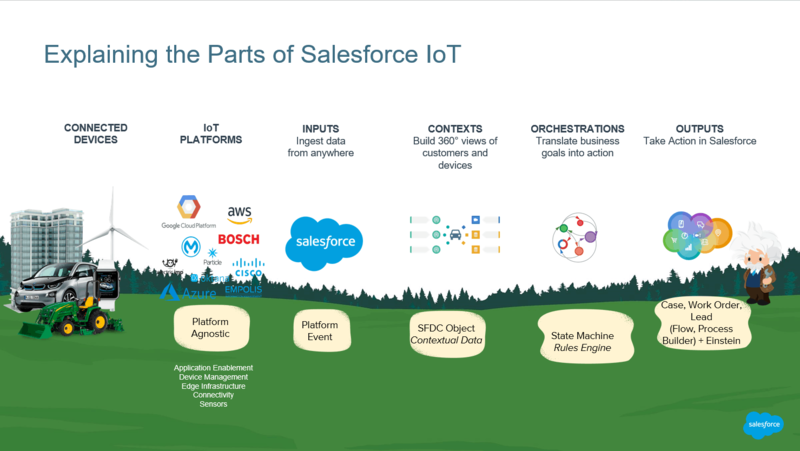 But with the integration of IoT in the Salesforce space, companies can scale their strategies by providing tools that can turn these billions of data points from millions of connected devices into customer experiences. You can connect every device, sensor, website, or interaction with Salesforce customer context data to get a better picture of your customer and how they interact with the device. Intuitive, language-based click tools can be put into place (that don’t require heavy coding) for your business users so that they can rapidly innovate in IoT by creating customer experiences that are totally unique to your business. All the data that can be collected via IoT devices can be sorted through to turn data into action by identifying significant events and triggering and automating near real-time output to any core Salesforce Clouds or a third-party service. WHY IS IoT AND SALESFORCE A SYMBIOTIC RELATIONSHIP? communication about services and products. WHAT IS THE VALUE OF THE IoT FRAMEWORK? Educate, nurture, and win customers to grow demand and score renewal revenue. Delight your customers to keep customer churn and maintenance costs at bay.